The tool is designed to modify the text case for the “Text Notes category “in Autodesk® Revit®. From add-Ins tab activate the tool. Select checkbox “1” if you want to convert to “Upper case”. Select checkbox “2” if you want to convert to “Lower case”. Select checkbox “3” if you want to convert to “Sentence case”. 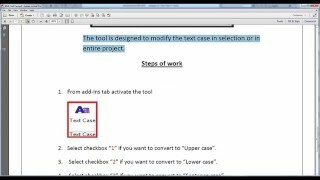 Select checkbox “4” if you want to convert “Title Case”.